It is a heady joy that we feel at witnessing how more and more businesses fall under the spell of open source software. There is nothing quite like the freedom of modeling the code into the quality instrument that fits all your necessities like a glove, isn’t it? This upward trend eventually turned into a perfect impetus for ModulesGarden to make the transition process even easier and cost-effective. Ladies and gentlemen, we present you a tremendously improved License Upgrade offering! A few months ago, you ordered the annual license of DNS Manager For WHMCS and it served you well up until recently, but now you feel like the standard scope of features somewhat hinders your progress, and you could really use some more flexibility. Sounds familiar? If you face this exact challenge, our License Upgrade solution has been introduced just for you. 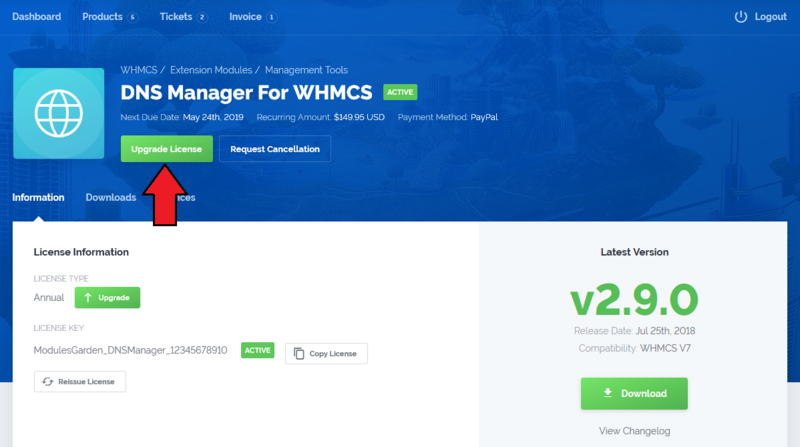 It opens up a totally hassle-free way to alter the license of any WHMCS module into its decoded version whenever you decide to do so, and without the need to place a separate order. Plus, this whole mechanism is fully automated so you do not even have to contact us – as convenient as it gets! Navigate to our client area → click the ‘Upgrade License’ button on the page of your product → pay the instantly generated invoice! And the best part? Whatever product you have the license of, the upgrade to open source is now available at a massive discount! And when we say ‘massive’, you know that we mean no less than that – the cost of the decoded product will be reduced by as much as 100% of the annual license’s price. Another major advantage is that you will pay for this changeover just once, and the source code will last you a lifetime! Leave behind the worry of software limitations taking the wind out of your sails. Start taking full advantage of ever more possibilities that accrue from turning to our open source gear, and save hefty amounts of both your time and money at one fell swoop! Yeah, I was suckered into your little promotion for a second – until i realised that you jacked the price of your uncoded versions by 200%!! James, much as we love huge numbers, 200% seems a big of an overstatement even for us. An eagle eye may certainly notice that some prices changed slightly a few months ago, but this adjustment concerns merely two products and was dictated exclusively by the extensive code reconstruction. How exactly would one take advantage of this offer? Is there an upgrade option in the client area or a promo code to enter? The easiest way is to follow the instructions provided right above. But do not hesitate to ask if it turns out you need any further advice on this matter.